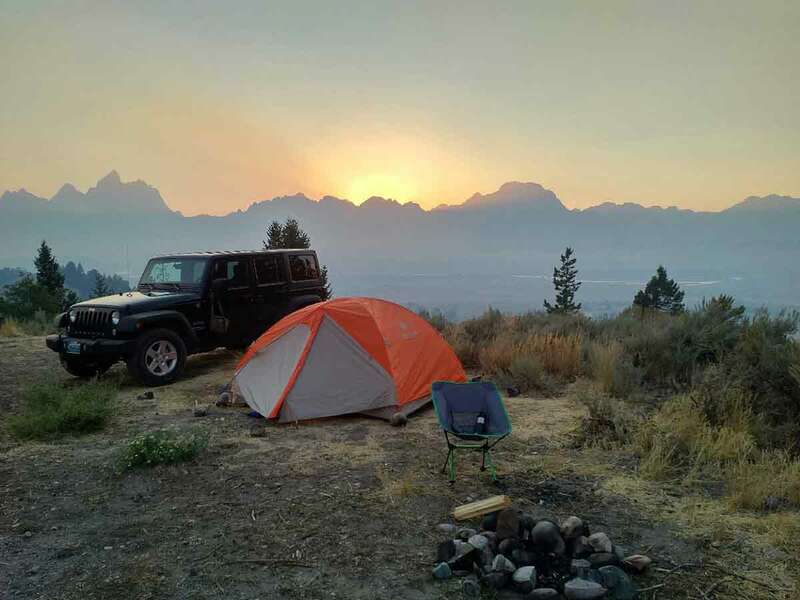 Looking for a unique camping site in the wilderness, I followed some directions from comments on a website related to free campsites and ended up in an incredible place just inside the Bridger-Teton National Forest about 24 miles north of the City of Jackson, Wyoming . After making a few left turns upon entering the Forest on Forest Road 30333 from Highway 89/191 near the Triangle X Ranch and the historic Cunningham Cabin, I found a few campsites with the amazing views. From this overlook, at 43.763932, -110.554111, there is a sweeping view of the Teton National Park and the Snake River valley which river makes its way from here, at its source at Jackson Lake, all the way to the Oregon and Washington border where it is a tributary to the Columbia River. The Teton Mountain range hangs above the river valley and Yellowstone National Park lies just beyond the northern edge of these mountains which edge is in plain view from this spot.